The powdered root is used to treat wounds and abscesses. It is widely used in Africa and elsewhere, and sold in Europe as an anti-diarrhoeal under the name Uzura. In traditional medicine it is also used to treat headaches. Dry powdered root and extracts of the root are apparently an excellent remedy for painful menstrual cramps and have an antispasmodic action. The root has been widely used for treating indigestion and malaria and other fever, including typhoid. An infusion is taken by mouth for malaria causing profuse perspiration. 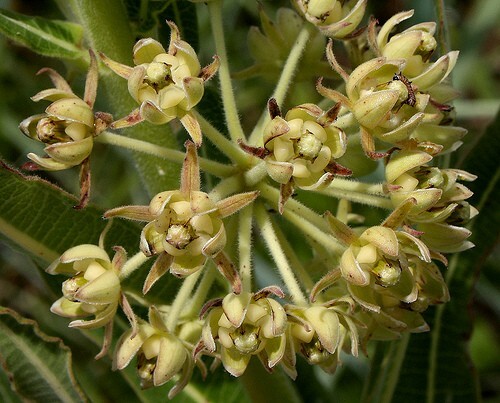 The plant is used as a protective charm to divert storms, and make dogs keen hunters. The Zulu ground up the stem in water as an emetic in poisoning. The Xhosa take an infusion or a decoction of the root for colic and abdominal troubles and use the powdered root as a snuff to relieve headache. They also apparently take wine in which grated root has been soaked, as a tonic and apply the latex to festering wounds as a prophylactic against the development of maggots. They also apply fomentations with the root to the chest for bad colds. The Mpondo use a root decoction or the powdered root alone as a dysentery remedy. The Nama take the root as a stomach carminative and diarrhoea remedy. The Tswana chew a piece of the root as an antidote to the effects of food poisoning. A cold water extract of the root has been used in the treatment of lumpy skin disease (“knoppiessiekte”) in cattle. Uzara came onto the pharmaceutical market in 1911 as a “new intestinal sedative" (antidiarrhoicum). In 1927 another preparation made from the root was put on the market under the name dysmenural. This was a tablet containing amongst other the active compound uzaron. More recently Uzara has been recommended for diarrhoea and dysentery, after birth cramps and as a tonic to the cardiovascular system. One of the names of this plant is udelunina which literally means forsaking ones mother ( dela , to forsake; nina , mother). This refers to the use for the plant-if ingested by a girlfriend/boyfriend, that person leaves her/his mother and goes to stay with the partner. milk bush, milkwort, uzura, wild cotton, wave-leaved xysmalobium (Eng. ); bitterhout, bitterwortel, bitterhoutwortel, melkbos (Afr. ); leshokoa, poho-tšehla (Southern Sotho); iyeza elimhlophe, nwachaba, ishongwane (Xhosa); iShongwane, iShongwe, iShinga (Zulu).